This is definitely a majestic tropical tree for landscaping! Ever so often, we come across these remarkable Traveller’s Palms that are either solitary grown or in a single row and even en masse. And, somehow we’re always awestruck by their strikingly impressive structures. 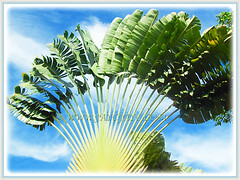 Though not a true palm tree, it is called a palm. 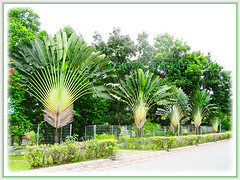 Its common name, Traveller’s Palm/Tree, is derived from the fact that fatigued travellers would quench their thirst on the rainwater that has been collected in the cupped base of the stems. Another probable explanation for the common name is that the fan leaves tend to face east to west direction, providing a crude compass for a disoriented traveller to find his/her way. 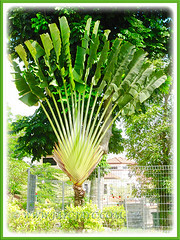 It is popularly grown for its unique, unusual and captivating form. Common Name: Traveller’s Palm, Traveller’s Tree. Etymology: The genus name, Ravenala comes from the Malagasy word, ravinala, meaning forest leaves. The species epithet, madagascariensis denotes its origin from Madagascar. Origin: It is native to secondary forests in Madagascar. 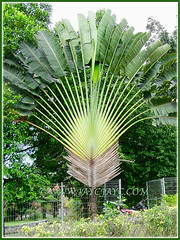 Features: Ravenala madagascariensis is monotypic, the only species of the genus, Ravenala. With a moderate to fast growth rate, this tropical evergreen tree grows between 9 to 12 m in height and spreads between 4.5 to 5.5 m wide. The banana-like or paddle-shaped leaves that arise from an underground corm are arranged in an enormous and distinctive fan-shaped manner. The deep green leaves (20-30 per tree) can grow up to 3.5 m long and 0.9 m wide. Each leaf is held on a thick and grooved stem or petiole which is as long or longer than the leaf blade. Strong winds can somehow tatter the attractive leaves. Whatever, the Traveller’s Palm can still stand majestically to capture one’s attention. 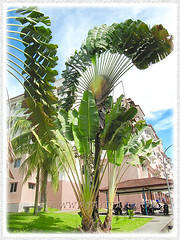 Eventually, as the upright-growing tree matures, it progressively loses the older leaves to form a palm-like trunk that grows up to 30.5 cm in diameter. The greyish trunk with obvious leaf scar rings will elevate the bilateral symmetry crown of beautiful leaves. Suckers or young plants will emerge from the underground corm. A mature tree can produce inflorescences, 30.5 cm long, consisting of numerous 3-petaled creamy-white flowers with boat-shaped green spathes. The inflorescence are somewhat similar to its relative, Strelitzia reginae (Bird-of-paradise), though considered less attractive. A seasonal bloomer whose flowers are followed by brown capsules that contain bright blue seeds. The Black and White Ruffed Lemurs is the only known pollinator of Ravenala madagascariensis. 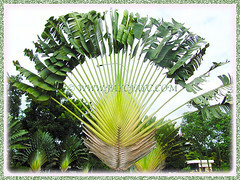 Culture (Care): Ravenala madagascariensis or Traveler’s Palm as commonly named, grows easily with minimum care. Light: Full sun for optimum growth when well established. Grow in partial sun or semi-shade when young. Moisture: Moderate water requirement. Keep soil moist. It benefits from a hot and humid environment. Soil: Grow in fertile, sandy and loamy soils with good drainage. Others: Older leaves and dried out brown petioles should be pruned off to keep it tidy and aesthetically pleasing. If you preferred a single specimen, remove suckers to avoid clustering. Deadhead spent flowers. Space plants at least 4.5 m apart if planted in a row for landscaping. Plant in containers to control its growth and size if located indoors. Feed it once monthly during the growing season with a balanced fertiliser high in nitrogen. 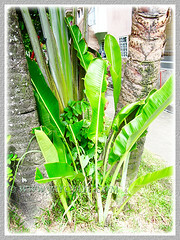 The hardy Traveller’s Palm is considered pest and disease resistant. 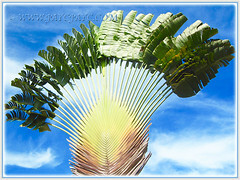 However, its leaves may be shredded by strong winds. For subtropical and temperate regions: Hardiness: USDA Zone 10-11, though some gardeners in Zone 9 have claimed that they have successfully grown the Traveller’s Palms with some protection during the occasional frost. The Traveller’s Palm should be grown only in frost-free locations outdoors. If possible, protect the tree from strong winds to prevent its leaves from being tattered. Where not winter-hardy, grow it indoors or in greenhouses, providing enough overhead room to accommodate its enormous head of leaves and a lot of bright light, as well as plant it in a large container to restrict its size. Propagation: Can be propagated from seeds, which are slow to germinate. An alternative and easier method is by removing and replanting the suckers or offsets that emerge at the base of the mother plant. 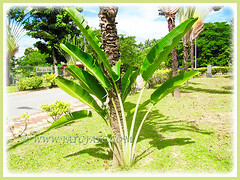 Usage: The exotic and tropical Ravenala madagascariensis when planted singly, will establish a perfect focal point in any landscape, including large home gardens. An impressive ornamental accent for public parks and parking lots at residential or commercial properties such as shopping malls. 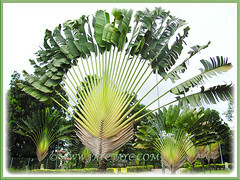 Outstanding tropical trees when planted in a row to line both sides of the driveway leading to large properties or just used as privacy hedges or to mark your home boundary. It is suitable for container planting which helps restrict its size, especially when located indoors or at the courtyard/patio.